Do you have a quilt top that needs quilting? Then you have come to the right place. There are numerous options to make your wishes come true and stay within your budget at the same time. This includes hundreds of overall designs that are programed on the statler quilting machine with no special border quilting. The statler is a computerized quilting machine that is known for its precision. This is great for busy quilts where intricate stitching would be lost in the fabrics. This is for the traditionalist who would prefer to have an overall design that is hand guided. This is done by following a pantograph or stitching out a freehand design. These are well suited to quilts or comforters that will be heavily used or that have busy fabrics, which would hide more intricate quilting. There are a variety of patterns to pick from such as pinecones, butterflies and daisies, kittens etc. My signiture award winning overall feathers and variations or the traditional baptist fan. Includes quilting that is specific to your creation, such as stitch-in-the-ditch or ¼” outlining, small meandering or texturing, or any two patterns. An example of the latter would be a single pattern over the main portion of the quilt plus a different but complementary pattern in the border. Outlining emphasizes your piecework or the patterns in printed fabric. A creative mixture of multiple designs and patterns that accentuate the quilt. This includes 3 or more designs on a quilt including the border, saching or outlining plus additional patterns in the center of the quilt. Any combination of patterns or designs, including your own, can be used to accent your creation. This is everything in the creative level plus inticate background fillers. The final product will be one you will be proud to show, give as a gift, or pass down as a family heirloom. 5742 x 0.01 = 57.42. The cost of the quilting would be $57.42. Quilt top should not be basted. If you are providing backing or batting, these must be at least 3” longer than the top on each side. For example, a 50” x 50” quilt requires 56” x 56” backing and batting. Quilt top, backing and batting should each be single pieces or be sewn and squared with straight edges and without selvages. If you are piecing the backing please use a ½’ seam allowance that has been ironed open. If requesting binding services, we will bind your quilt using a straight-edged double-fold binding. It will be applied by hand. A minimum of 1 yard of additional fabric is needed, or you may supply your own pre-cut binding. Why Have Your Quilt Quilted Professionaly? 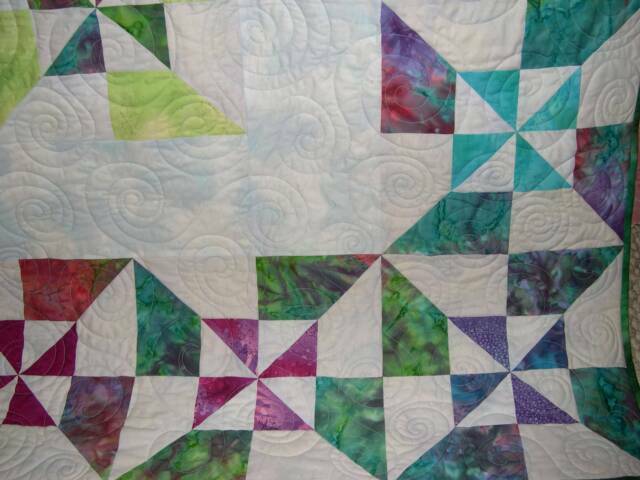 Lack of desire to quilt, particularly large or complex projects. No quilting experience, but may have purchased or inherited quilt tops. If you are not totally satisfied and are willing to pull out all the stitches, I will be willing to re-quilt it at no charge.